Note pads are an ideal way to promote your company name and keep it in the minds of your customers and prospects. They make ideal ‘jotter” pads for busy professionals. 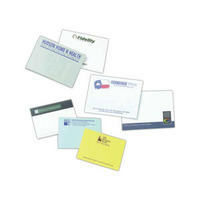 These self adhesive note pads can be imprinted with your company name, logo and contact information. We can differentiate your pads from the rest by using a bright colored paper or including graphs or lines on the pad. Includes 100 sheets in either blue, gray, green, ivory, ultra white or yellow. Available in post consumer recycled paper.